Sang Hre Cinzah looked groggy as he sat in his living room. It was noon and children were running in and out, but for Cinzah, who had worked a 12-hour night shift at an auto parts warehouse, it was bedtime. Still, he was eager to talk about what it was like adapting to his new life in the United States, and what his initial expectations were. “A lot of people talked about how here we’d have freedom of religion, and living-wise it’s really nice. But I hadn’t been here, so I didn’t have any idea of what to believe or not to believe,” he said through a translator. 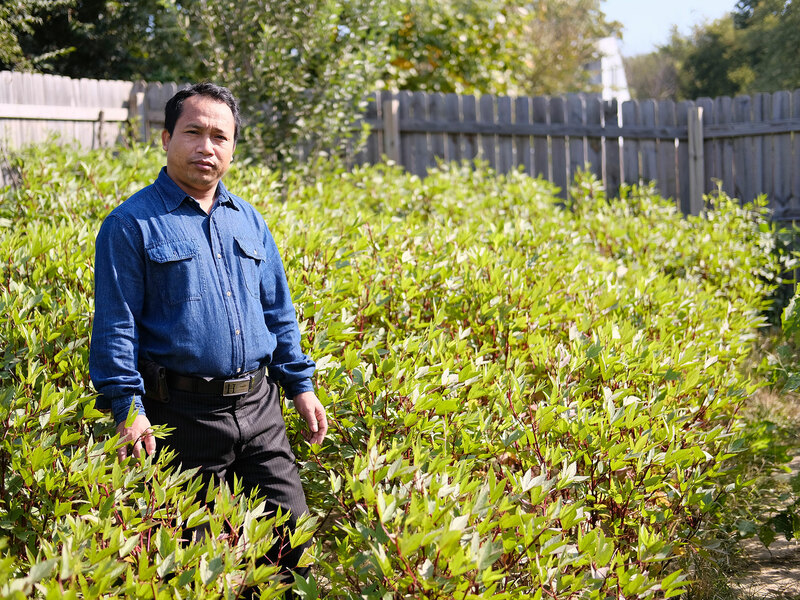 Cinzah, a refugee from Burma, said there was only one thing that was important to him in coming to America, and that was practicing his Christian religion without fear of persecution — a freedom he said he did not have in his home country. “It’s really important for me because what I believe is the truth, this is going to be my eternity,” he said. The largest refugee group entering the United Sates in 2015 was not Muslim and was not from the Middle East. It was comprised of Christians from Burma; 18,318 of them resettled in the U.S. — more than the number of refugees from Iraq, Iran, Afghanistan and Syria combined. And just as in past years, many of them headed for the south side of Indianapolis to join the biggest concentration of Burmese refugees in the country. The refugee crisis is a global issue. At the end of 2015, more than 65.3 million people were displaced from their homes, according to the United Nations High Commissioner for Refugees, and about 70,000 of them were granted refugee status in the United States. News media coverage of the migration of thousands of desperate people fleeing the civil war in Syria has especially captured the world’s attention. But nothing symbolized the Syrian tragedy like a single photo of 3-year-old Alan Kurdi’s tiny body. The dead toddler washed up on a Mediterranean Sea beach near Bodrum, Turkey, in September 2015 after he had drowned the night before with his brother and mother when their dinghy capsized. That image did as much as anything to prompt calls for Western countries to admit Syrian refugees. The same month Alan Kurdi died, President Obama announced that the United States would take in 10,000 Syrian refugees in the next year. Many groups and politicians approved of the White House plan, but there also was immediate opposition, especially by Republicans who said terrorists would be able to enter the country under the guise of being refugees. In November 2015, a horrific terrorist attack in Paris left more than 100 people dead and one of the suspects was believed to be a Syrian refugee. Within days, 31 governors announced they objected to admitting Syrians into their states. Indiana Gov. Mike Pence, now Republican nominee Donald Trump’s running mate, was one of the first to issue a directive blocking Syrians. President Obama recently increased the number of refugeesallowed into the United States by 30 percent from 85,000 in fiscal year 2016 to 110,500 in 2017, including 40,000 from the Near East/South Asia, which includes Syria, and again the response was predictably mixed. Trump has been critical of Obama’s plan, and he has declared that Hillary Clinton, if elected, would make things worse by admitting even more Syrians. Although recent statistics from the State Department’s Refugee Processing Center show the United States admitted slightly more refugees in 2016 who were Muslim (38,901) than Christian (37,521), Syria actually accounted for only a third of the Muslims. Also, a majority of the people in the top three refugee nationalities entering the country this year were Christians. It all seems to get obscured by political rhetoric suggesting hordes of terrorists from war-torn Syria are overwhelming U.S. borders. Cinzah, 45, lives in a house with 11 people, most of whom still don’t speak English. His wife, Lang Kil Sung, 43, and six children between the ages of 9 and 21 live with him. A sick aunt sleeps in a room adjacent to the main living area, and a brother and his young son live across the hall. The small single-family house is crowded and everyone is on different schedules. Cinzah, for example, works from 5 p.m. to sometimes 5 a.m.
Cinzah said he is searching for his family’s own housing, but he said what they have now is better than what they had back in Burma where they lived on a farm and were barely able to make ends meet. “The biggest problem (in Burma) is the government and the military people. They are racist to our race; our race is called Chin. So they are racist to us because we are farmers and we are Christian,” said Cinzah, who fled Burma for Malaysia before getting refugee status to move to the U.S. in June. Burma, also known as Myanmar, has a population of almost 60 million people and borders India, China, Laos, Thailand and Bangladesh. The country is predominantly Buddhist, with Christianity and Islam making up the key minority religions. A civilian government was sworn in this past March after five decades of military dictatorship, but the military retains considerable power. The Chin have been described as one of the country’s most persecuted ethnic minorities, especially at the hands of the military. Cinzah’s description of life in Burma is not unusual. Many Burmese refugees talk about fearing for their lives back home and having a desire for religious freedom, education and economic stability. Myint Myint fled to Malaysia in 2006 where she lived for 10 years and sent money back to her daughter, Linlett, and parents before she finally received refugee status to move to the United States. Life in the United States still isn’t easy for her. She can’t drive so she recently bought a bicycle for transportation. She’s working the night shift at a hair product warehouse, and she said she’s very lonely because she had to leave behind her parents, her 14-year-old daughter and her second husband, whom she met in Malaysia. But there is a silver lining. “Here is a safe life. I don’t need to be afraid,” Myint Myint said. Joshua Hlawnmual said he was very involved with his church in Burma but he still longed for a genuine sense of freedom of religion, along with the goal of an education for himself and his children. Hlawnmual left Burma in 2007 with his niece, whom he later adopted, and moved to Kuala Lumpur, Malaysia — a city most Burmese refugees flee to before applying for official refugee status at the United Nations. They lived in Malaysia for three years before they were resettled in the United States. He now works at Catholic Charities in Indianapolis as a social worker helping new refugees. “I think the United States is the best place for Christians — people that believe in God — because we all know that the country was established and begun by believers who came from England, right?” Hwlanmual said. Refugees from all backgrounds have been settling in Indianapolis for many years. “We’ve worked with 33 nationalities since we started 35 years ago, from our beginnings with Cubans to the breakup of Yugoslavia, Ukraine, Rwanda. Many, many different countries,” said Cole Varga, director of Exodus Refugee Immigration, a group that helps refugees resettle in the city. But 2015 was the first time Exodus Refugee got caught in the crosshairs of the refugee debate. “No one paid attention to refugees before it was on the news every night and with what was happening in the Mediterranean,” Varga said. Varga was specifically critical of Gov. Mike Pence’s order for local refugee organizations to stop taking in refugees from Syria or face a withholding of funding. “It’s not something we take lightly — to discriminate against a group that has already been discriminated against — so we were happy to stand up for the refugees we serve,” he said. Exodus, along with the American Civil Liberties Union of Indiana, decided to sue Pence. “It seemed like an obviously appalling example of discrimination based on nationality and origin and insinuated itself as a formal policy,” said Ken Falk, the ACLU lawyer who led the challenge. Falk argued that Indiana chose to opt-in to the refugee resettlement process in the state — a fact the state didn’t deny — and that they couldn’t back out halfway through the fiscal year, or with only one refugee group. Pence’s lawyers made the case that the directive wasn’t discrimination based on nationality because it was focused on anybody of any nationality coming from Syria rather than specifically on Syrians. And they argued that the governor had the right to make decisions to keep his state safe. “We’re dealing with a process that is exclusive to the federal; the federal government has the ability and the president has decided to take these refugees, a tiny fraction of refugees from Syria,” Falk said. And the courts agreed. Exodus won an injunction to stop the directive in February and in early October the Seventh Circuit Court of Appeals rejected Pence’s appeal. A spokesman for Pence said his administration is “still continuing to evaluate the ruling” and deciding whether it will appeal again. If they do, the case has the opportunity to make it to the Supreme Court. Texas pulled a similar directive after the Seventh Circuit decision, and Varga and Falk hope their suit will set a precedent across the country. The ruling, however, did not stop the board of trustees in Waterford Township, Mich., from voting this past week to ban Syrian refugees. For those already living in the United States, like Joshua Hwlawnmuaul, a new life already is taking shape. Hwlawnmual and his wife were granted U.S. citizenship this year, and they will vote in their first presidential election Nov. 8. Hwlawnmual said he plans to vote for the candidate who upholds the values of his religion. His choice: Donald J. Trump.